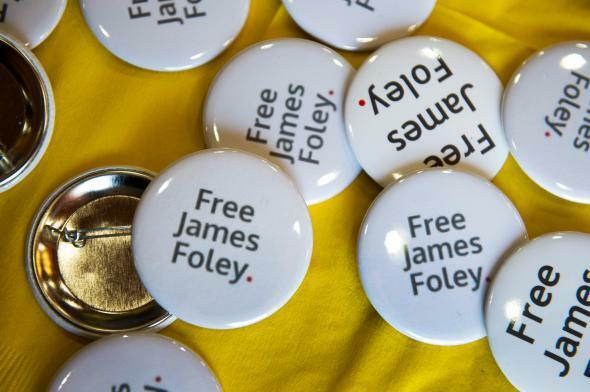 Buttons in support of James Foley are displayed at an event on May 3, 2013, in Boston. Under a newly announced policy, the U.S. government will no longer threaten the families of hostages held by terrorist groups abroad if they attempt to pay ransoms. The new directive, first reported Monday by Foreign Policy, comes after a monthlong review of U.S. hostage policy ordered by the White House after the highly publicized murders of several Americans by ISIS. However, not everyone in the administration got that memo. The mother of slain American journalist James Foley was reportedly told by a White House National Security Council staff member that she could face criminal charges if she attempted to pay a ransom for his return. The new directive is a welcome effort to make sure no staffer does that again. The new directive will also create mechanisms within the government to oversee hostage crises including a “fusion cell” within the FBI, a team at the White House to manage policy, and a State Department envoy to coordinate contacts with foreign governments during the negotiations. This is also in keeping with long-standing U.S. policy. Communicating with hostage takers, terrorist or otherwise, can buy valuable time and help authorities gain useful information. But in the years since 9/11, the “no concessions” mandate has been interpreted by some lawmakers as a “no negotiations” or “no contact” policy. Now it’s clear that is not the case. The new guidelines are a sensible step, but the U.S. is still likely to face painful moral choices and occasional legal contradictions when dealing with hostage crises. It’s one of the many downsides of fighting a seemingly never-ending war against an ever-changing and ill-defined enemy.